Maybe Ahed Tamimi could've picked a better way to resist the Israeli occupation of Palestine than slapping, kicking, and throwing rocks at soldiers, but she's already been jailed for almost two months, and could face months or even years more if convicted. Maybe Israel needs to shake its fist at the truly violent offenders, and acknowledge that its own heavy-handed actions in the Palestinian territories breeds frustration that results in this kind of response. 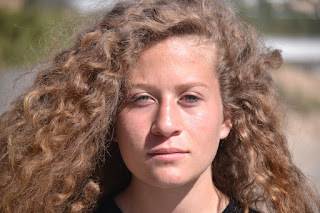 She's a teenager who's seen family arrested and killed by Israelis. Of course the people of Israel don't want to see their soldiers "assaulted," but the people of the West Bank and the Gaza Strip don't want to see their citizens, their fathers and mothers and children, assaulted, imprisoned, and killed, either. Neither the Israelis nor the Palestinians should want to indoctrinate Ahed to believe that the only way to respond to injustice, real or perceived, is through extremism. And hiding the court proceedings doesn't help Israel's standing at all, even/especially when the court claims it's in the defendant's best interests despite her attorney arguing otherwise. The situation needs to change, for Ahed and all the Palestinian children and all the Israeli children.